E-auction will take place on www.pmmementos.gov.in. The items on sale include swords, musical instruments, ‘pagadis’ (turbans), shawls, traditional jackets, bows and arrows, masks, canvases, prints and photographs of historical and political figures and sculptural media crafted from metal, stone, wood and plaster of Paris. Attending Sunday’s event, Railway Minister Piyush Goyal lauded the initiative by the Prime Minister to utilise the gifts received by him to accelerate the Namami Gange project. 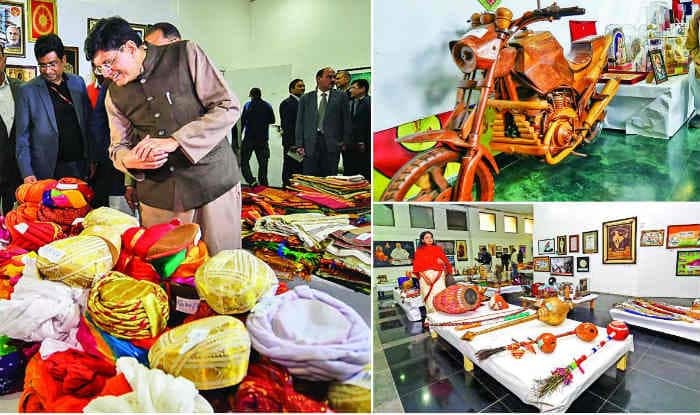 “Initially slated to be auctioned in October 2018, the sale was delayed due to preparations for the auction,” NGMA Director General Adwaita Gadanayak told IANS, adding that the objects reflect India’s diverse crafts. “The bidders supported the cause wholeheartedly. Certain items, such as a statue of Chhatrapati Shivaji Maharaj, priced at Rs 1,000, was auctioned for Rs 22,000. Items such as statues of Gautam Buddha, portraits, photographs and paintings of Prime Minister, 3D painting of Gomukh (an origin of the holy river Ganga), statue of Mahatma Basveshwara, statue of Swami Vivekananda and a silver-coated Shivlinga were also auctioned at a high price,” a release said. Among the mementoes fetching the highest price was a Thangka wall hanging (sold for Rs 12,500) and a miniature statue tribute to the Statue of Unity (sold for Rs 11,000). The buyer of the painting Surjit Yadav, Vice President of Hindu Sena, told IANS that it was his way of contributing to the Namami Gange project. Udit Chawla, another participant who bought a portrait of the Prime Minister for Rs 1,600, said he liked the portrait and the man depicted. The auction had no buyer’s premium and no Goods and Services Tax (GST) applicable to the purchases. The live auction continues on Monday. From Tuesday up to Thursday, an e-auction of the more expensive items along with the remaining ones will take place on www.pmmementos.gov.in.